We've had a run of decent numbers recently: employment and wage growth doing okay, and the current account surplus improved last quarter. But the Q3 GDP numbers don't look good at all. It's not that the quarterly growth rate itself - 1.7%, a bit shy of the 2% forecasters had been expecting - was so bad. The problem is the trend: monthly GDP growth for September went negative. Not the kind of momentum you want going into Q4. A weakening US economy, falling oil prices, and now this. Yikes. One of the ideas floating around in the wake of the federal govt's economic update is the notion that more should be done to promote research and development in Canada. The usual way of promoting this project is to play up the link between R&D, technical progress and productivity: if the payoff from subsidising R&D would be an improvement in Canada's anemic rate of productivity growth, then it might be an idea worth pursuing. There are a couple of reasons to think that subsidising R&D is not the way to improve productivity growth. The first one is raised by EclectEcon: R&D doesn't have to take place in Canada in order for us to benefit from it. If we can buy the new technology more cheaply than we can produce it domestically, then we're better off trading for it - just as we trade for other goods and services. Another is that it's not clear that a subsidy for R&D would pass a cost-benefit analysis - and that it's even possible to imagine that too much R&D is being done. Many R&D projects amount to what Philippe Aghion and Peter Howitt call a Schumpeterian process of 'creative destruction': displacing an existing technology with one that is (possibly only slightly) better. The private returns to R&D can be enormous: the prospect of displacing Microsoft must animate the imagination of many IT entrepreneurs. But society's measure of the gain would be the difference between the old and new technologies; just replacing Bill Gates with another multi-billionaire wouldn't affect society's welfare very much. Same thing for medical research. If too much of what the R&D sector does consists of 'business stealing', then it's entirely possible that - from society's point of view - some of the resources currently engaged in R&D should in fact be be diverted toward other sectors. Presenters should concentrate on giving us the big picture: the motivation, key assumptions, the main results, and the intuition behind those results. Don’t try and grind through countless equations in excruciating detail; you won’t have time, and nobody cares (if anyone does care about all the equations, they can do much better by reading the paper). Speak slowly, clearly, and avoid reading from a prepared text. Yes, you risk making the occasional mistake, but the audience will be much more engaged if you speak naturally, and look at them as you speak. If you must use slides (no, it is not mandatory), use a maximum of about 5 pages, each with a maximum of about 5 lines. It always takes longer to present anything than you think it will. Aim at about 10 minutes, and you will probably find that you finish after 18 minutes. And there is no law against speaking for less than your allotted time; so if you do run out of things to say, just sit down, and allow more time for audience discussion of your paper. Discussants have a harder job, because a good discussant will often change what he says in light of the author’s presentation, so you need to think quickly. You do not (normally) need to re-describe the paper; the author should already have done that. But if you have a different, and possibly better, way of explaining the paper, you should certainly take the opportunity to do so. You do not (normally) need to evaluate the paper either. Too many discussants feel they have to say the paper is a good and interesting paper, and it just comes out sounding trite. Focus instead on where you disagree with the author, or want to emphasise something about the paper or its subject that you believe the author has overlooked. If you have some ideas about how the paper could be improved, you should tell us. From the February 2006 CEA newsletter. 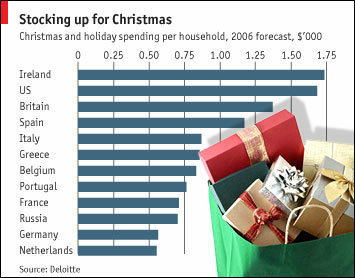 You'll see every G-7 country there but one - Canada (okay, Japan's not there either, but that's because Christmas is less of a consumer spending season there). And you'll also see forecasts for Ireland, Portugal, Greece and Belgium - whose combined GDP is about 20% less than that of Canada. This happens a lot in The Economist, and it generally annoys the heck out of me. What are we, chopped liver? Sadly, yes. Even though Canada is one the the main destinations for migrants, we don't do very well in attracting visitors. Why? 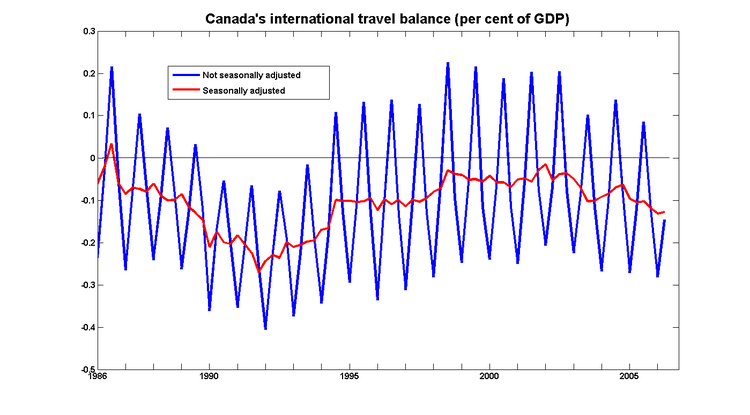 Well, if you compare the raw data for the international travel balance to the seasonally-adjusted series, one explanation suggests itself immediately. The only time we have a positive balance is in the third quarter: July, August and September. One of the effects of global warming might be to make Canada a more attractive place to visit. But there has to be a less drastic way of getting the attention of The Economist. Mark Thoma at Economist's View has been wading through what non-economists think of economics, and he's finding the exercise somewhat frustrating. For someone who hasn't had formal training in the field, anti-economics is often more persuasive than the real thing. Paul Krugman ran into this particular brick wall a few years ago, and realised that the correct response to many criticisms of economics is "You just don't understand". I used to think that the yawning gap between economists' understanding of economic issues and that of non-economists was primarily a problem of communication: we simply were not doing our job of explaining our ideas to the broader audience of non-specialists. But it sometimes seems as though explaining economics to non-economists is as difficult - and as frustrating - as explaining the theory of evolution to creationists. Intelligent Design as applied to economics takes pretty much the same form as it does with biology: "What we observe couldn't have just happened; it's obviously the work of some Greater Power." When it comes to evolution, the Greater Power generally takes the form of an omnipotent diety. The counterpart in economics is the 'economic elite': the existence of inequality is interpreted as evidence that those who have done well did so by design. Economists do of course try to explain that market outcomes are the result of decentralised interactions between self-interested agents - and that these interactions generally lead to socially desirable outcomes. (And even when those outcomes are not desirable, market-based solutions are generally better than those based on what a central planner could come up with.) But once you've convinced yourself that elites are manipulating market outcomes, it's all-too-easy to persuade yourself that those who would argue otherwise must necessarily be bought-and-paid-for apologists for the omnipotent elites. And once you've persuaded yourself of that, it becomes pretty much impossible for anyone to say anything that will budge you from your position. "But the pension fund was just sitting there"
The federal government's economic update was released the other day, complete with the eye-catching proposal to be "debt-free" by 2021. I don't know what's worse: that the Conservatives expected it to be swallowed, or the fact that some journalists did. It turns out that the measure of debt they're talking about is "net debt", which counts pension assets, but which doesn't count pension liabilities. I don't know about you, but when a government starts paying attention to a debt measure that ignores pension obligations, I get nervous. The Bank of Canada says "It ain't broke, so we're not fixin' it"
The primary objective of Canada's monetary policy is to enhance the well-being of Canadians by contributing to sustained economic growth, rising levels of employment and improved living standards. Experience has clearly shown that the best way monetary policy can achieve this goal is by giving Canadian households and businesses confidence in the value of their money. It has been 15 years since Canada adopted an inflation-targeting framework to guide its monetary policy. During this time, Consumer Price Index (CPI) inflation has been reduced to a low, stable and predictable level of close to 2 per cent, real output has expanded at an average rate of 3 per cent per year and the unemployment rate has fallen to 30-year lows. Although a generally supportive international environment, coupled with significant domestic economic reforms and a prudent fiscal policy track, has played an important role in these positive developments, a key contributor has been Canada's monetary policy under the inflation-targeting framework. The joint commitment of the Government of Canada and the Bank of Canada to the inflation targets has helped anchor inflation expectations. It has also provided a more stable and certain economic environment in which Canadians can make their investment and spending decisions. The target will continue to be defined in terms of the 12-month rate of change in the total CPI. The inflation target will continue to be the 2 per cent mid-point of the 1 to 3 per cent inflation-control range. The agreement will run for another five-year period, ending 31 December 2011. The Bank will continue its ongoing research into potential improvements in the monetary policy framework. Before the end of 2011, the Government and the Bank will review the experience over the period and the results of the research, and determine the appropriate target for the years ahead. There have been a few counter-proposals suggested over the past few weeks: raising the target to 3%, lowering it to 1%, and aiming at a target for the path of the price level (as opposed to its rate of increase). But none of them offer compelling arguments that would lead us to believe that these policy changes would generate benefits that would outweigh the possible costs of a) getting the new policy wrong, and b) undermining the stock of credibility that the Bank has accumulated over the past 15 years. For once, the crass appeal to the base is also the perfect means of broadening the base; the cynical vote-buying thing is also the right thing. A lot of arguments are going to be made about this, so let’s get one point straight off the top. This isn’t about bribing mothers to stay home, nor is it one of those social-engineering Tory tax credits aimed at rewarding one type of behaviour or another. The fundamental case for income-splitting is one of fairness. Besides, horizontal equity isn't the only consideration. Since the gains would largely go to those at the upper ends of the income distribution, vertical equity should be taken into account as well. Andrew Coyne's solution would be to have a flat income tax - but we already have a flat tax. Income splitting would only accelerate the trend towards more income inequality. Make it easier for students from low-income households to pursue post-secondary education (no, this does not mean reducing tuition fees). And if they really, really feel that they have to cut taxes, they should be cutting corporate taxes, which are high by international standards. The payoff here would be increased investment and productivity. Canada's low rate of productivity growth is a chronic problem, and is much more important than the one that income-splitting would solve. There's a debate at the WSJ online about the pros and cons to keeping the penny. My view is that we should toss the penny and the nickel altogether. The reason is simple: today's dime has the buying power of a penny circa 1946 in both Canada and the US. I defy you to go to any store, anywhere, armed only with 9 cents and with the challenge of buying something. Anything. If it's necessary, we can still quote prices in cents for certain items: gasoline prices are already quoted up to one-tenth of a penny, even without a $0.001 coin. "All economic news is bad"
Easterbrook’s Law [is] named for the American journalist Gregg Easterbook, who first conclusively proved that all economic news is bad: all news means change, and all change, no matter how broadly beneficial, makes some people worse off -- who are invariably the focus of media attention. Canada's manufacturing sector, largely centred in Ontario and Quebec, has already suffered 83,000 job cuts this year after being stricken by the effects of a higher Canadian dollar, soaring energy costs, widespread labour shortages in the West and cut-throat competition from lower-cost Asian players like China. The ongoing economic slowdown south of the border, led by a sinking housing market, is also curbing demand for Canadian-made goods in that key export market. Given that more than half of manufacturing shipments are exported, the sector is bracing for a total of 100,000 layoffs this year, said coalition spokesperson Jayson Myers, who is also chief economist of Canadian Manufacturers & Exporters. "The key question is what part of all of that high-value adding activity and those high-paying jobs are we going to continue to attract and retain here in Canada?" Myers said. Job plan bypasses Ontario: A plan Ottawa launched yesterday to fast-track the entry of temporary foreign workers — but only to booming Alberta and British Columbia — has left critics wondering why Ontario's own labour crunch is being ignored. Immigration Minister Monte Solberg announced in Edmonton he will ease the rules for recruiting foreign temporary workers and get them processed faster — from the current three or four months to as little as two. "Canada's new government has been listening to employers in Alberta and British Columbia, and they are truly having a hard time finding enough workers," Solberg said. "The improvements we are announcing are making it easier, faster and less costly for employers to hire temporary foreign workers." The catch: Ontario isn't in on the plan, despite big shortages of ready workers in jobs such as construction. "It's not going to address the needs of Ontario's robust economy at all. Our construction industry is facing a huge labour shortage in many trades," said Andy Manahan, executive director of the Residential and Civil Construction Alliance of Ontario. The real story is how the Canadian economy is dealing with a large terms of trade shock. It's causing sectoral shifts, but the net effects are - so far, at least - generally benign. But that's just not alarming enough to merit media attention. "To you from falling hands we throw / The torch"
"We the undersigned feel enormous gratitude for the sacrifice made by all the Canadian Armed Forces through the ages in defence of this country and its values; acknowledge the very special nature of the sacrifice made by those who fought in the First World War in appalling conditions and with terrible loss of life; note that only three First World War veterans remain, and urge the Prime Minister that their sacrifice, and all of those they served with under arms from 1914-1918, be celebrated by offering a state funeral to the family of the last veteran of the First World War resident in Canada." Sign up here. And pass the word along. The process is quite easy, provided you borrow enough. Have you ever, dear readers, had occasion to borrow money? Have you ever borrowed ten dollars under a rigorous promise of your word of honor as a Christian to pay it back on your next salary day? Have you ever borrowed as much as a million at a time? If you have done these things, you cannot have failed to notice how much easier it is to borrow ten thousand dollars than ten, how much easier still to borrow a hundred thousand, and that when you come at last to raising an international loan of a hundred million the thing loses all difficulty. Here below are the little scenes that take place on the occasion of an ascending series of loans. "Say, look here, old man, I was wondering whether perhaps you wouldn't mind letting me have ten dollars till the end of the month -"
"Oh, I could give it back all right, for dead sure, just the minute I get my salary." "You see, I've got into an awful tangle - I owe seven and a half on my board, and she said yesterday she'd have to have it. And I couldn't pay my laundry last week, so he said he wouldn't leave it, and I got this cursed suit on the installment plan and they said they'd seize my trunk, and -"
"Say, but Gol darn it, I lent you five dollars, don't you remember, last November, and you swore you'd pay it back on the first and I never got it till away after New Year's -"
"I know, I know. But this is absolutely sure. So help me, I'll pay it right on the first, the minute I get my check." "Yes, but you won't -"
"No, I swear I will -"
And after about half an hour of expostulations and protests of this sort, having pledged his soul, his body, and his honor, the borrower at last gets his ten dollars. The second degree in borrowing is represented by this scene in which Mr. John McDuff, of McDuff Bros. Hardware Store (Everything in Hardware), calls on the local bank manager with a view to getting $1,000 to carry the business forward for one month till the farmers' spring payments begin to come in. Mr. McDuff is told by one of the (two) juniors in the bank to wait - the manager is engaged for the moment. The manager in reality is in his inner office, sorting out trout flies. But he knows what McDuff wants and he means to make him wait for it and suffer for it. When at last McDuff does get in, the manager is very cold and formal. "Sit down, Mr. McDuff," he says. When they go fishing together, the manager always calls McDuff "John." But this is different. McDuff is here to borrow money. And borrowing money in Central City is a criminal act. "I came in about that loan," says McDuff. The manager looks into a ledger. "You're overdrawn seventeen dollars right now," he says. "I know, but I'll be getting my accounts in any time after the first." Then follows a string of severe questions. What are McDuff's daily receipts? What is his overhead? What is his underfoot? Is he a church-goer? Does he believe in a future life? "You'll have to get your partner to sign." "And you'd better get your wife to sign." "And your mother, she might as well sign too -"
There are more signatures on a country bank note for one month than on a Locarno treaty. And at last McDuff, of Everything in Hardware, having pledged his receipts, his premises, his credit, his honor, his wife, and his mother - gets away with the thousand dollars. Here the scene is laid in a fitting setting. Mr. Pingpoint is shown into the sumptuous head office of the president of the First National Bank. "Ah, good morning," says the president as he rises to greet Mr. Pingpoint, "I was expecting you. Our general manager told me that you were going to be good enough to call in. Won't you take this larger chair? - you'll find it easier." "Ah, thank you. You're very comfortable here." "Yes, we rather think this a pleasant room. And our board room, we think, is even better. Won't you let me show you our board room?" "Oh, thanks, I'm afraid I hardly have the time. I just came in for a minute to complete our loan of a million dollars." "Yes, our executive Vice-President said that you are good enough to come to us. It is very kind of you, I'm sure." "And you are quite sure that a million is all that you care to take? We shall be delighted, you know, if you will take a million and a half." "Oh, scarcely. A million, I think, will be ample just now; we can come back, of course, if we want more." "And do you want us to give any security, or anything of that sort?" "And is there anything you want me to sign while I am here?" "Oh, no, nothing, the clerks will attend to all that." "Well, thanks, then, I needn't keep you any longer." "But won't you let me drive you up town? My car is just outside. Or, better still, if you are free, won't you come and eat some lunch with me at the club?" "Well, thanks, yes, you're really extremely kind." And with this, quite painlessly and easily, the million dollars has changed hands. This occurrence is best followed as it appears in its triumphant progress in the American press. New York, Friday - An enthusiastic reception was given yesterday to the Right Hon. Mr. Samuel Rothstein, of the British Cabinet, and to the Vicomte de Chauve Souris, French plenipotentiary, on their landing from the Stacquitania. It is understood that they will borrow $100,000,000. The distinguished visitors expect to stay only a few days. New York, Saturday - An elaborate reception was given last evening in the home of Mrs. Bildermont to the Right Hon. Samuel Rothstein and the Baron de Chauve Souris. It is understood that they are borrowing a hundred million dollars. New York, Monday - The Baron de Chauve Souris and the Right Hon. Samuel Rothstein were notable figures in the Fifth Avenue church parade yesterday. It is understood that they will borrow a hundred million dollars. New York, Tuesday - The Baron de Chauve Souris and the Right Hon. Samuel Rothstein attended a baseball game at the Polo Grounds. It is understood that they will borrow a hundred million dollars. New York, Wednesday - At a ball given by Mr. and Mrs. Ashcoop-Vandermore for the distinguished English and French plenipotentiaries, Mr. Samuel Rothstein and the Baron de Chauve Souris, it was definitely stated that the loan which they are financing will be limited to a hundred million dollars. New York (Wall Street), Thursday - The loan of $100,000,000 was subscribed this morning at eleven o'clock in five minutes. The Right Hon. Mr. Rothstein and the Baron Baton Rouge de Chauve Souris left America at twelve noon, taking the money with them. Both plenipotentiaries expressed their delight with America. "It is," said the Baron - "how do you call it? - a cinch." And yet, six months later, what happened? Who paid and who didn't? Hardup Jones paid $5.40 within a month, $3.00 the next month and the remaining one dollar and sixty cents two weeks later. McDuff Bros. met their note and went fishing with the manager like old friends. The Pingpoint Syndicate blew up and failed for ten million dollars. And the international loan got mixed up with a lot of others, was funded, equated, spread out over fifty years, capitalized funded again - in short, it passed beyond all recognition. And the moral is, when you borrow, borrow a whole lot. How much damage can the Democrats do to free trade? Free trade is the real election casualty: As a result of this year’s election, it now seems unlikely that the new Congress will extend President Bush’s “fast-track” trade negotiating authority, which expires this summer. The results are further bad news for the Doha round and bilateral trade agreements with South Korea and other countries. It is possible that congressional Democrats will revive efforts to saddle China with punitive tariffs as punishment for alleged “currency manipulation”. It would be going too far to say that the 2006 election ushers in a new protectionist consensus. But free trade has definitely left the building. If the past six years could be characterised as a crusade in favour of freer trade on the part of the US administration, then there would be cause for concern. But the typical reaction from the US' trade partners to this sort of spin is hollow laughter: the Bush administration's handling of the steel tariff and the softwood lumber dispute doesn't resemble the behaviour of a principled free-trader. Free trade may have been in the building. But it appears to have been lying in state. The 'old minimum wage research' - summarised here - found that the effect of an increase in the minimum wage on employment was significant. The 'new minimum wage research' - à la Card and Krueger - found that the effect was not significant. When the idea of increasing the Quebec minimum wage to 10$/hr was floated a few years ago, UQAM's Pierre Fortin took a look at the literature and asked himself: Why? He came up with what I think is a very plausible conjecture, one that explains many things, and offers some insight about the various minimum wage proposals that are floating around these days. When Samuel de Champlain in 1603 sailed up the St. Lawrence River and agreed to support the Algonquian Indians at Tadoussac against the aggression of the Iroquois, he could not foresee that the petty strife between those two apparently insignificantly hordes of 'savages' would one day decide the fate of New France and of the vast territory that stretched for an unknown distance to the west. At the time no other choice lay open to him. The migratory Algonquians and their allies, the Hurons, controlled most of the territory which he hoped to explore, possessed the best means - birch-bark canoes and snow-shoes - of travelling through that territory, and supplied the furs from which he hoped to finance his explorations. Of the Iroquois to the southwest he knew little except that they practised agriculture, built permanent or semi-permanent villages, and were far less rich in the furs which at the time seemed to be the most important of the country's natural resources. Had Champlain, like his predecessor Cartier, encountered first Iroquois on the St Lawrence river and discovered their military strength and genius for political organization, France might to-day be the dominant power in North America. But fate decreed that the hostility of a few thousand Indians should check the expansion of the new colony and determine the course of history. A higher discount rate, predicated on a high economic growth rate and more in line with commercial realities, would discount future costs so that they appear much smaller to today’s consumers and taxpayers. It would make the costs of global warming in 100 years’ time appear small or even negligible in present-day terms. As far as I can tell, pretty much every structural macroeconomic model makes use of a rate of around 3% to discount future utility. Since there are many reasons to think that an even lower rate is appropriate for an analysis of climate change, it's probably quite sensible to consider slightly lower values as well. As far as the arithmetic goes, Wilkinson has a point: a higher discount rate would indeed significantly affect the present-value calculations. But there's no earthly reason to think that the proper discount rate is the one used to discount the returns from a capital investment project. The return on those sorts of investments incorporate a risk premium over and above the rate at which the investor discounts future utility. For most investments, that risk premium is positive, since their payoffs are generally positively correlated with movements in consumption. But since the benefits of of addressing climate change are unlikely to have any particular correlation to movements in consumption (i.e., the business cycle), the appropriate risk premium for discounting the benefits of slowing global warming is approximately zero. The federal Conservatives' decision to eliminate income trusts has generated a certain amount of fuss (even The Economist noticed), especially in the form of sharply reduced share prices for companies that had structured themselves to take advantage of the tax breaks they provided. Much of the media coverage about the pros and cons of income trusts has revolved around the lost corporate tax revenues - the figure most often cited is Jack Mintz' estimate of $1.1b. But that's not the reason why the Department of Finance clamped down; they're running surpluses so large that an extra $1b a year would be somewhat of an embarrassment. Although the income trust segment is still quite young when compared to the traditional equity markets, the early indications are that the fastest growing and highest yielding sectors have not accessed this capital market while the slowest growing and lowest yielding sectors have. From an economic efficiency viewpoint, this is a significant inter-firm distortion to be aware of, especially since part of its causation lies in the unintegrated part of the corporate tax. If income trusts were shifting capital away from sectors that were generating the highest return, then there's little reason to keep them. The Ontario NDP has introduced a private member's bill to increase the Ontario minimum wage from $7.75/hr to $10.00/hr, and its cousins in Ottawa have proposed a $10/hr minimum wage for workers under federal jurisdiction. The question is: why? We know that the link between those who earn the minimum wage and those who are in poverty is tenuous. And although the short-run effects of increasing the minimum wage on employment are - as far as we can tell - insignificant, evidence from Canada suggests that the long-run effects are non-negligible. The expected effects of an increase in the minimum wage on poverty are approximately zero; a much more effective policy would be something like an earned income tax credit as in the US and Quebec. The minimum wage is a blunt instrument for reducing overall poverty, however, because many minimum-wage earners are not in poverty and because many of those in poverty are not connected to the labor market. We calculate that the 90-cent increase in the minimum wage between 1989 and 1991 transferred roughly $5.5 billion to low-wage workers.... an amount that is smaller than most other federal antipoverty programs, and that can have only limited effects on the overall income distribution. It is often assumed that the low minimum wage is the reason for hunger amongst the working poor. Indeed, the minimum wage stayed at $6.85/hr in Ontario between 1995 and 2004. However, Figure 10 shows 53% of all food bank clients earn more than $10/hour, higher than the current minimum wage of $7.75/hour; just 10% receive exactly the current minimum wage. The key issue identified in the research is not the wage, but that food bank clients only work, on average, 25 hours weekly. Working part-time hours, 72% of employed clients are not receiving health benefits. Sixty percent say they want more hours at work, but are unable to get them from their employer. Their preferred policy? An earned income tax credit. When economists and food bank activists agree that a minimum wage increase is unlikely to do anything to reduce poverty, you have to wonder why the NDP thinks it's a good idea.